Caught your attention didn't it? It'll make sense in a moment I promise. So the hubby and I bought a FURminator. I'd heard good things about it and so when the hubby got home early from work today I suggested we go to town and do some shopping. It's a wondrous invention. 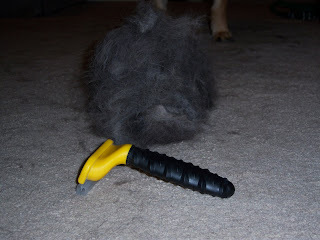 It's a brush for your dog or cat to help with their shedding. It brings up fur from the undercoat as well as loose hair. After probably an hour of brushing the dog we got this fur pile the size of a tribble. We jokingly called it the kill of the day. Kaiser was in Heaven, but after a while he got tired of the brushing and ran away. Odie did get jealous so I brushed him a bit and got enough fur to make a mouse. Kasier was extremely jealous the whole time I brushed the cat so hubby had to bribe him with treats. I think both of them will be hiding from us for the rest of the night because we brushed them so much. If you have pets that shed a LOT then I highly recommend it.